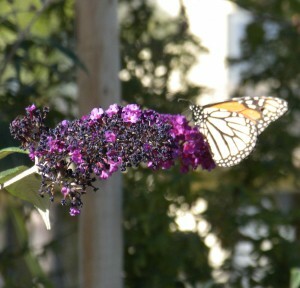 This is Part Four in this blog series on “The Rebirth of a Garden”. See Part 1, 2 and 3. 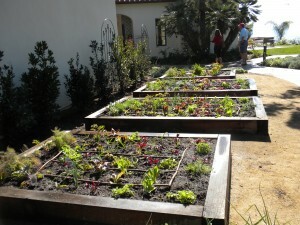 Preparing for the big two day installation at Terranea, I picked up my load of beautiful edibles from International Nursery in El Segundo and unloaded them at the edible garden site at Mar’sel (the gourmet restaurant at Terranea Resort). It was a thrill to look at these beautiful, healthy plants. A good nursery will put out nothing less. If you see plants at your nursery that are obviously not being watered sufficiently, have diseased or insect-damaged leaves, are overly pot-bound (roots growing out through the drainage holes in the bottom of the pot. STOP and find another nursery! It is important to know how to spot problems with plant stock at a nursery BEFORE you get them home! Yes, this was going to be a lovely garden. Back at home, I realized that the long-awaited soil test had come back. pH of 7.8! Ok, ladies and gentlemen, please note that under the best of circumstances, you should have weeks (if not months) for pH adjustment prior to planting. Because of our crunched time line, I had already gone ahead and amended and worked the soil but now realized that I was working with a higher than desired pH. 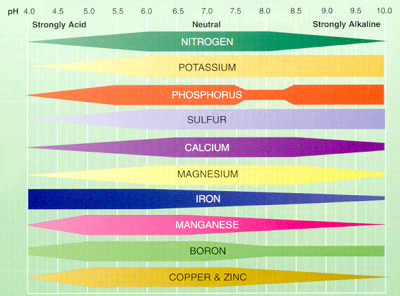 Adjusting pH does not happen overnight in fact, depending on your soil, it can take many months to effect any change. Following the recommendations on the soil analysis, I picked up a bag of organic sulfur. Acidifying the soil will take about 3-4 months. I really didn’t need a huge adjustment and most of the crops we were planting can take a pH at that level without too much of a struggle. I’d have to watch the plants carefully though and perhaps do a foliar feeding with fish and kelp emulsion. As the soil becomes more alkaline (higher pH), the more difficult it becomes for the plants’ root systems to take up certain macro and micro nutrients which leads to the slow starvation of the plant (see Figure 1). Ok, disaster averted…fingers crossed! Installation Day 1 has arrived, Oct. 30. 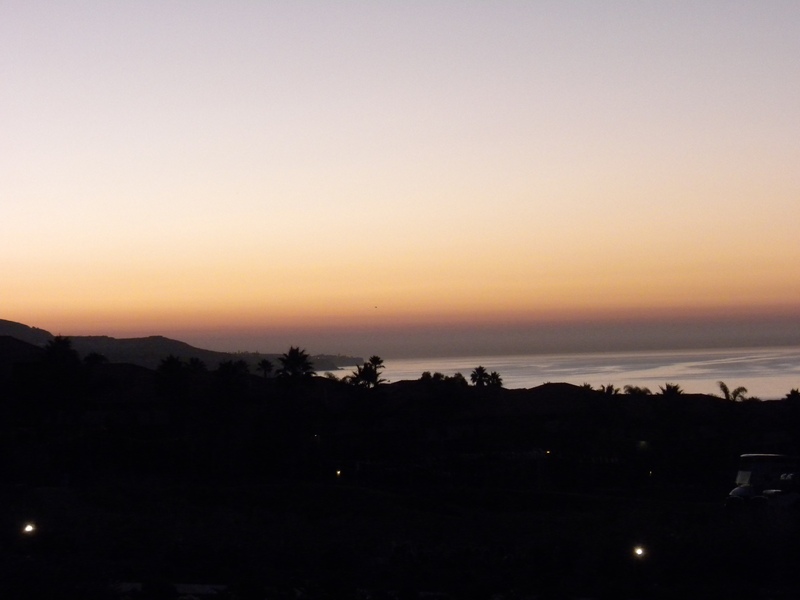 (Wow, it was so dark at 6am). Out came the sun and soon so did the butterflies! 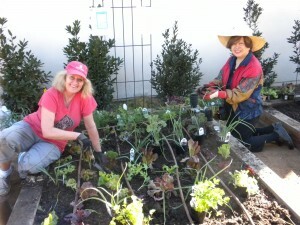 I was joine d by my beautiful HGEL garden volunteers, Lola Clark and Linda Nientes. What hard workers! They were great! Before we got started, I reviewed proper transplanting technique with them and then we worked through the soil once more and leveled it. 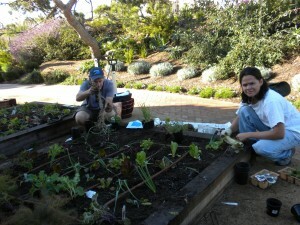 Using the plot plan, I placed out the plants as Linda and Lola came behind me and planted them in. What team work! 3) maturation rate (Succession Planting). And, of course, a plan is key when putting together an accurate order for your nursery or grower. You don’t want to over-buy! These ladies were such good helpers! 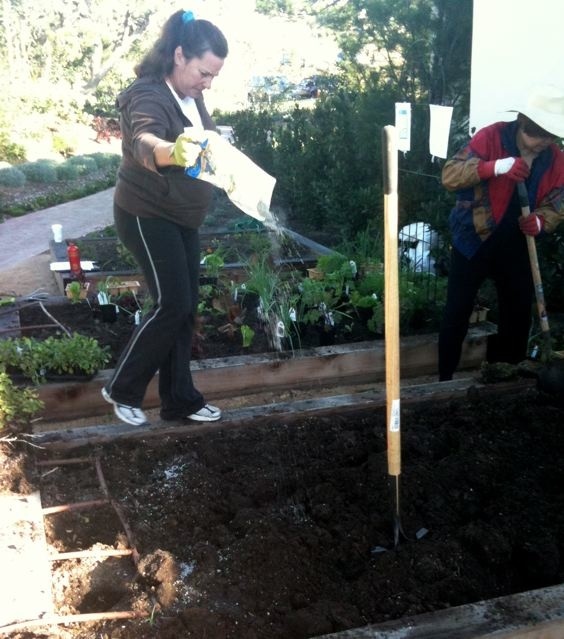 We had a blast learning and sharing tips, tricks and gardening stories as they went…AND we were done in record time! Thanks ladies! October 31st – Installation Day Two. 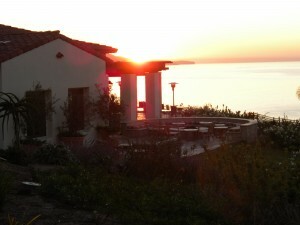 I saw the sunrise at mar’sel again…so worth it! With two more beds to finish it was time to get down to work. I guess today was the guys day because who shows up but HGELers Davey Monzon and Kevin Dorman! Great work and a great workout, guys (well gardening always is, isn’t it?)! Thanks for showing up and helping out! 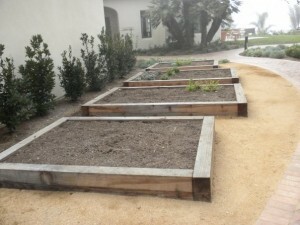 As this garden approaches its first anniversary at mar’sel, I would like to thank the hard working and forward thinking folks at Terranea Resort in Rancho Palo Verdes…. Executive Chef, Christian Schmidt for his ongoing support and… most importantly Chef de Cuisine, Michael Fiorelli, Manager, Neil Hedin, Mixologist, Blake Donaldson (The Drink Chef) and all of the wonderful mar’sel staff for their time helping me plan the garden, process the harvests and especially for their support and respect of locally grown and organic food. Thank you all for your willingness to give this garden another try and for having the guts to hand over your garden to some strange woman who saw the potential in what you were trying to do! For updated photos of this and other HGEL commercial gardens, please see the Commercial Gardens page of the groedibles.com website. A Rebirth of a Garden – an inspiring slideshow of how community volunteers learned in and loved this garden… and about this journey of mine which began only because I wasn’t afraid to try. So, if there is a journey you’ve been wanting to take, a dream you want to realize – now’s the time. Set your fears aside and take that first step…or shovelful. You’ll never know until you try!